Assume we have two web sites in IIS 6.0 – website1.com and website2.com. We want each web site to use its own version of php.ini file. Let’s assume that php.ini for website1.com is located in C:\Inetpub\website1.com folder and php.ini for website2.com is located in C:\Inetpub\website2.com folder. First step is to create script mappings and FastCgi configuration sections for each web site. For that you can use the helper script fcgiconfig.js located in %WINDIR%\system32\inetsrv\ folder. Execute the following commands to create PHP script mappings for website1.com and website2.com. Make sure you put the correct path to PHP executable instead of <php_path> and correct site ID instead of <site_id>. Now [PHP website1.com] and [PHP website2.com] can be used to specify some site specific FastCGI configuration settings. We are going to use these sections to specify the path to php.ini file for each of the web sites. How could we apply rewrite rule on IIS? For more specific I want to apply rewrite rule for zend framework using IIS. The security of the server cannot be affected? It depends on what version of IIS you are using. If you work with IIS 6.0 then you can use either ISAPI_Rewrite or IONICS Rewrite Filter . If you work with IIS 7.0 then you can use the Microsoft URL rewrite module . As usual, in shared hosting environment you would need to ensure that account that is used to run php-cgi.exe has minimal set of privileges. It is recommended that you turn on fastCGI impersonation for PHP. 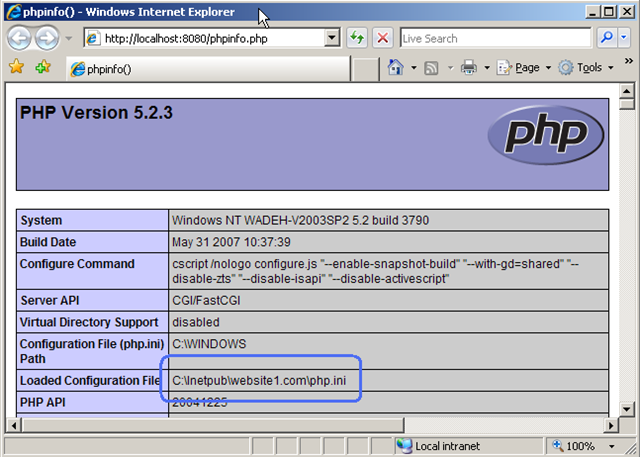 That way php-cgi processes for each web site will be running in a security context of impersonated user for that site. This article explains how to configure fastcgi on IIS 6.0 and turn on impersonation. Thanks for reply. Im using IIS 5.1. I have installed ISAPI_Rewrite on my system. Now rewrite rule is working fine. but I have rewrite rule problem with zend framework. Is there any other settings I have to apply? Im using following rule for zend framework. The only thing I can think of is that it may be possible that Zend Framework relies on the REQUEST_URI server variable to contain the original un-rewritten URL. This server variable is not available on IIS 5.1. ISAPI_Rewrite sets another server variable “HTTP_X_REWRITE_URL” that contains the original URL. s.r., you are correct. That was a typo – the correct path is %WINDIR%\system32\inetsrv\. Thanks for pointing that out – I’ve fixed the text now. @Abdallah: Turned out that the problem is caused by semicolons at the end of the types declarations. If you remove those it should work. This will be fixed in the RTW release of the FastCGI Extension 1.5. As usual, in shared hosting environment you would need to ensure that account that is used to run php-cgi.exe has minimal set of privileges. It is recommended that you turn on fastCGI impersonation for PHP. That way php-cgi processes for each web site will be running in a security context of impersonated user for that site. 1. Worker process (w2wp.exe) starts under appPoolUser as expected. 2. php-cgi.exe start under the same appPoolUser identity (as per TaskManager). Why php-cgi.exe does not run under webUser? or am I missing something? @igor: The php-cgi.exe will run under the appPoolUser identity – this is expected. But it will impersonate the web site user when performing any file system operations. This way for example you can have the same PHP process pool handling requests from multiple web sites and as long as the sites use different anonymous identities, the PHP scripts for those sites will not be able to read each other files because PHP will impersonate the site’s user when reading or writing files. Great Topic, Thanks for sharing Ruslany. I’ve a question about security and it is not related to this topic. When a php shell like C99 runs on windows, it can traversal from one directory to another directory or even one partition to another partition. How can we prevent it ?